Concerns have been raised about the impact the Fairfax-Nine merger will have on regional newspapers and the diversity of news coverage across Australia. Fairfax and Nine on Thursday announced a $4 billion merger that would create in integrated media giant across television, online video streaming, print, digital and real estate advertising. Nine will be the dominant partner, with its current shareholders holding 51.1 per cent of the merged company’s shares. Country Press South Australia president Ian Osterman, who is editor of the independent Mount Barker Courier, said the merger would remove regional newspapers from the “management epicentre”. “There’s always been some criticism of Fairfax in the past that it was city-centric and Sydney-centric, and the regional newspapers in its stable were left out of the decision-making,” he said. Fairfax has 160 regional publications and community-based websites, including the Newcastle Herald, The Border Mail in Albury-Wodonga, The Courier in Ballarat and the Illawarra Mercury in Wollongong. Mr Osterman said regional newspapers were going to be a small fraction of the merged enterprise, and that “has some danger signs”. “I think the regional newspapers would be benefited by having people with ink in their veins running the organisation, rather than the bankers based in Sydney running the organisation,” he said. In New South Wales, Newcastle’s media landscape could be set for a major shakeup because of the merger, which would put the Newcastle Herald and television’s NBN News under the same corporate banner. University of Newcastle communications lecturer Paul Scott said the merger could diminish media diversity in the Hunter region. “What’s really important here is how newsrooms are arranged and managed and how news-gathering in the new order is determined,” he said. “That’s going to be a key issue, because certainly Nine doesn’t have the Fairfax tradition of separating journalism from commercial activities. An article on the Newcastle Herald’s website said it was too early to tell what impact the merger could have locally. The merger came as no surprise to Royal Melbourne Institute of Technology School of Media and Communication honorary research associate Vincent O’Donnell. “Ever since the Government deregulated the 75 per cent reach rule and that you could only own two out of the three media, this has been one of the mergers that has been most likely,” he said. “Essentially it’s a good fit. 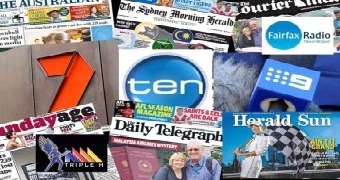 Nine is TV and digital media and Fairfax is papers and radio, particularly in Sydney and Melbourne. Dr O’Donnell said with every merger there was frequently job losses. “Particularly journalists on the front line, so that there are fewer and fewer people reporting on the events of the day for the rest of Australia, and when fewer people report, the diversity of opinion, the diversity of coverage is decreased,” he said. “If anything, we need more opinions on how things are run, what politicians are doing, both local, state and federal. Dr O’Donnell said regional radio had been consolidated over the years. “A lot of regional radio except for the ABC is networked out of Sydney or Melbourne,” he said. “The local newspapers survive because they have things to say locally, and one of TV’s weaknesses has always been because of the cost of production they do tend to focus on the cities. Curtin University journalism lecturer Glynn Greensmith said the announcement would likely affect younger journalists who traditionally started their careers at local newspapers after they graduated from university. “They’ve been providing great opportunities. There are Fairfax papers all over Western Australia,” he said. “It’s been a fantastic avenue for terrific young journalists who have gone out there into regional WA and honed their craft and become passionate storytellers. Former Fairfax journalist Julie Posetti, from the Reuters Institute at the University of Oxford, said she was concerned by about the proposed merger. “I’m concerned as a news consumer in Australia,” she said. “And I’m concerned from the perspective of someone who’s invested in an international context in media pluralism, which means recognising the importance of a variety of different proprietors and operating models, from public broadcasting through to as many diverse publishing groups as you could get. Labor’s federal spokesman for regional communications Stephen Jones labelled the proposed merger a takeover. The Member for Whitlam in the NSW Southern Highlands said he was concerned the move would lead to massive job losses, particularly in rural and regional areas. “Is this going to mean more or less voices telling stories, bringing us the news?” he said. “Is there going to be a reduction in news-gathering capacity, particularly in regional areas where we’ve seen so many job losses of the past four years? Fairfax’s $4 billion merger with Nine divides journalists in its Sydney and Melbourne newsrooms, with some arguing the deal is nothing more than a takeover of one of Australia’s strongest cultural institutions. Prime Minister Malcolm Turnbull said the deal highlighted the necessity of the reach rule law change, saying the merger would strengthen both companies, which were operating in a “tough, competitive” environment. 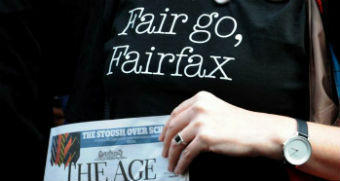 Fairfax chief executive Greg Hywood said news and investigations would remain central for the merged company. Any deal remains subject to shareholder approval from both companies, as well as a review by the Australian Competition and Consumer Commission, which it said was likely to take about three months to complete.